A new stage is developing in the devotion of the faithful to St. Thérèse of Lisieux. In 1947, the fiftieth anniversary of her death, a congress of theologians was held in Paris with the object of studying the theological implications of St. Thérèse’s spiritual doctrine and of tracing her relationship to the other ascetical writers of the Church. Among the phases of Thérèse’s spirituality, her devotion to the Mother of God deserves special attention. For if, according to sound theology, all graces are given to us through Mary, the extraordinary graces which made Thérèse, in the words of Pius XI, “a miracle of virtue” should be no exception, as even a summary analysis of her life will fully confirm. “The greatest saint of modern times,” as Pius X described her, was also one of the most devoted lovers of the Blessed Virgin Mary. This is the opinion of the Italian Mariologist, Gabriele Roschini, writing in his collection of Marian sketches, Con Maria, Editrice Ancora, Milan. The present analysis is based largely on this study. Thérèse Martin came from a household where the Mother of God may truly be said to have ruled as Queen. A statue of the Immaculate Conception – made of plastic and measuring 36 inches in height, which had been given to her father as a young man – occupied the place of honor in the house. Before this statue Thérèse’s mother consecrated her nine little children, one after the other, shortly after birth, and gave all of them as their first name, the chosen name of Mary. Gathering around the statue every night, M. Martin led his family in common prayers. And after prayers, each child was allowed to render some special homage to Mary’s statue, which, we are told, would often have to have its fingers replaced after the children had scrambled all at once to kiss Our Lady’s hands. The Martins belonged to the parish of Our Lady of Alencon. As one child after another was given to them by God, the father and mother joined in asking the Mother of God that all their children might be consecrated to the service of her Son. Their prayer was not unanswered: four of the children died in their baptismal innocence, shortly after birth, and the other five, Pauline, Marie, Léonie, Céline and Thérèse, were consecrated to God in two orders of the Blessed Virgin, Our Lady of Mt. Carmel and the Visitation. Until Thérèse was nine years old, her sister Pauline took the place of her mother. But in 1881 when Pauline entered the Carmel at Lisieux, her younger sister felt the shock so severely that she came down with a nervous malady from which according to human calculations she was never to be cured. She seemed to be almost constantly in delirium. The doctors were perplexed about the nature of the sickness, but were sure that it could not be cured. Already since the age of three, Thérèse had a strong desire to enter the Carmelites. And now her sister’s entrance intensified this attraction. But there were obstacles in the way. One was her extreme sensitivity, considered irreconcilable with the Carmelite way of life. What to do? She betook herself to her Heavenly Mother who, on Christmas night, 1886, happily freed her from this impediment. However, a more serious obstacle still remained: she was too young to be received. Finally in Rome, on November 20, 1887, she asked the Holy Father, Leo XIII, for permission to enter Carmel at the age of fifteen. The Pope referred the decision to her immediate superiors. And so, on April 9 the following year, the transferred feast of the Annunciation, Thérèse Martin realized her life’s ambition of entering the Order of Our Lady of Mt. Carmel. Her life of union with the Mother of God became daily more intense. According to the late Prioress of Carmel at Lisieux, what contributed not a little to this was the classic treatise, “On the True Devotion of Blessed Virgin Mary,” by St. Simon de Montfort, which Thérèse frequently read and meditated upon. Following Simon de Montfort’s advice, she did everything with Mary, or rather, in the presence of Mary, under Mary’s influence and according to her example. The very name of Mary was enough “to transport her heart with joy.” Her prayer to Our Lord was that He would always remember her as the daughter of the same Mother as Himself. This thought so fascinated her that she never tired of repeating it. “Everything is mine,” she wrote Oct. 19, 1892, to her sister Céline, “God is mine, and the Mother of God is also my Mother, … something I find myself saying to her, ‘You know, dear Mother, that I am happier than you? I have you for Mother, whereas you do not have the Blessed Virgin to love…I poor creature am not your servant, but your daughter. You are the Mother of Jesus, and my Mother too.’” And in an outburst of love she was prompted to say, “0 Mary, if I were Queen of heaven and you were Thérèse, I would wish to be Thérèse, to see you Queen of Heaven.” These were the last words written by the saint, three weeks before her death, on a picture of Our Lady of Victories. There are 238 letters of St. Thérèse in the latest collection, edited by l’Abbé Combes in 1947. In the spirit of the canonical rule of not concluding a Process of Beatification till fifty years after the death of a Servant of God, the Carmelite Superiors of Lisieux waited until now to publish all the extant correspondence of the Little Flower. This correspondence gives us an insight into what may be called the external apostolate of the Patroness of the Missions. Running through the letters is a spirit of reliance on the example and assistance of the Mother of God that is truly remarkable. A year later (July 8, 1891) she is writing to Céline about a certain Hyacinthe Loyson, who apostatized from the priesthood. Again the burden of her letter is a plea for holiness, but now as a sacrifice to obtain Loyson’s conversion through the Mother of God. “We must not grow weary of praying” for the unfortunate man, she says. “Confidence works miracles…. And in any event it is not our merits but those of our Spouse, which are ours, that we offer to our Father who is in heaven, in order that our brother, a son of the Blessed Virgin, should come back vanquished to throw himself beneath the cloak of the most merciful of mothers.” Thérèse, who had prayed for the apostate throughout her religious life, offered her last Communion for him in 1897, August 19, the feast of St. Hyacinthe. Loyson is known to have been converted on his death bed, fifteen years later. On the day of her profession, Thérèse had asked Our Lord, as a nuptial gift, “the martyrdom of heart and body.” She obtained both. During Holy Week in 1896, she had the first flow of blood from her lungs; but she was not taken to the infirmary until July of the following year. She herself remarked that on entering the infirmary, her first glance rested on the miraculous statue of the Blessed Virgin, which was brought there to keep her company. Witnesses say that she was favored on this occasion with another visitation from the Blessed Mother, judging by the transport of joy that covered her face and the subsequent testimony which she gave. Finally on the morning of September 30, she observed that this had been her last night on earth, and added, “How fervently I have prayed to Our Lady….And yet it has been pure agony, without a ray of consolation.” Towards three o’clock in the afternoon, seized with a convulsion that shook her whole body, she opened her arms in the form of a cross. The Superior placed an image of Our Lady of Mt. Carmel on her knees. 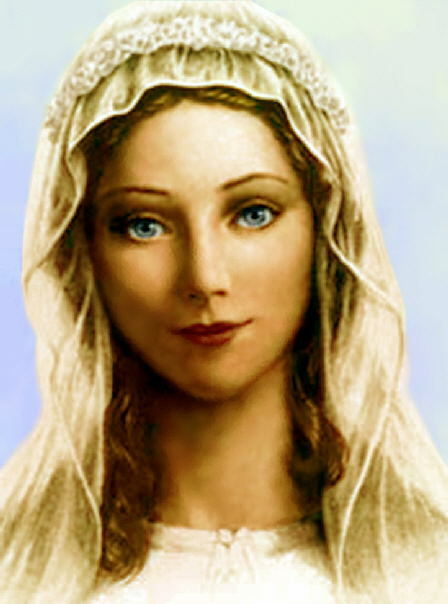 Thérèse looked at it for a moment and said, “Mother, recommend me quickly to the Blessed Virgin. Prepare me for a happy death.” Three hours later, as the monastery bell was ringing out the Angelus, with her eyes fixed on Our Lady’s statue, she passed into eternity.